For SecondLife Terms & Conditions, please click here. Thanks for visiting our website. We are Osprey Europe Ltd, the European distributor of Osprey and a company registered in England and Wales no. 4881712 with registered address Talon House, Aston Way, Poole, Dorset BH12 4FE. VAT number GB835 1864 16. For information on how to contact us click here. Osprey products are produced by Osprey Packs, Inc. a US corporation incorporated in the state of Colorado, of 115 W. Progress Circle Cortez, Colorado 81321 USA. References in these terms and conditions (“Terms”) to “us” or “we” are to Osprey Europe Limited. References to “Osprey” are to Osprey Europe Limited and Osprey Packs, Inc. Please read these Terms carefully before using our website or placing an order with us. If you’re under 18, please get a parent or guardian to read through these Terms and discuss them with you. If there are any of the provisions of these Terms that you don’t understand, please contact us to discuss. If you don’t accept these Terms (note in particular terms 8 and 9) please don’t use or order from our website. If you visit or use our website and/or place any orders with us you’ll be bound by these Terms, and they will form a contract between you and us. These Terms apply to the entire contents of our website and to any correspondence by email between us and you. Our Privacy and cookie statement doesn’t form part of these Terms but should be read also. Some parts of our website may also contain additional provisions which apply in addition to these terms. We may change these Terms at any time, in which case the amended Terms will be posted on our website and will apply from the date we post them (including to all entries to any competition or prize draw received after the date the changes were posted), with the exception that any orders that we have already accepted from you before the new Terms are posted will continue to be subject to the Terms in force when your order was made. Please check these Terms on each occasion you use our website. If you continue to use our site you will be bound by the latest Terms. You agree to only use our site in a manner that complies with all applicable laws and regulations and is consistent with these Terms and doesn’t infringe the rights of anyone else, nor restrict or inhibit their use and enjoyment of our site (including, amongst other things, hacking). We reserve the right in our sole discretion to deny any user access to our website without prior notice. You may access and use most parts of our website, and purchase goods, without registering your details with us. To track order statuses, create and store shipping addresses, manage newsletter preferences and account details, enter a competition or prize draw, post comments or other content to our website, you need to register with us. Please ensure that the details you provide us with are correct and complete and inform us of any changes to the information that you provided when registering. You must make sure that you keep your password confidential. This means that you must not share your password or let anyone else access your account. Always ensure you log out of your account at the end of your session to avoid anyone else using it. You should inform us immediately if you have any reason to believe that your password has become known to anyone else, or if your password is being, or is likely to be, used in an unauthorised manner. We may disable any username or password, whether chosen by you or allocated by us, at any time, if in our opinion you have failed to comply with any of the provisions of these Terms. We use, store and process information about you in accordance with our Privacy and cookie statement. By using our website, you consent to our use, storage and processing of your information in accordance with that statement. 5.1.3. Confirmation from you that the information you have provided is accurate, complete and not misleading. 5.2.4. Impersonating any person or entity, or falsely stating or otherwise misrepresenting your affiliation with anyone or any entity. 5.3. If you post or transmit to our website or social media pages any material of the type prohibited under term 5.2 above (or which otherwise results in a claim or action against us) and we incur any costs, expenses, liability or losses as a result, then you agree to indemnify us for all such costs, expenses, liability and losses. 5.4.4. We shall be entitled to reveal your identity (or any information which we have about you) to any third party who claims that any of that material violates any of their rights or to any government or regulatory authority that is entitled or requires us to do so. 5.5 Before sending us any materials containing information relating to, or images of, other people, please make sure that those people have agreed to their information/names/images being used in this way to the extent that this is necessary. Use of images is a complicated issue but as a general guide, if your photo/video features a crowd of people, you are less likely to need to obtain the consent of each person in the picture/video than if your photo/video is of a small group of people or a single person. The easier it is to identify a person from your photo/video, the more likely it is that you will need to obtain their consent. Special care should be taken when providing information or taking photographs/videos of children. 5.5. We may remove or edit any material or posting you make on our website or social media pages at any time. 6.1.3. Keep a record of the number of “Tell a friend” emails that you attempt to send. 6.2.4. Send a personalised message within the email that contains inappropriate content or that is otherwise in breach of these Terms. 7.1. You acknowledge that all copyright, trade marks and other intellectual property rights in our website and all photographs, footage, designs, images, text, software, data and other material in our site or generated by our site are owned by Osprey or our licensors. You are permitted to use the site and this material only as expressly authorised by us. 7.2.4. The material is not used in a manner which may damage our reputation or otherwise be harmful to us. 7.4. If you wish to use any material from our site other than in accordance with term 7.2 above please email your request to care@ospreyeurope.com with the subject line “Permissions request”. 7.5. The Osprey name and logo, plus our products names and feature names, such as Viper and Stow-on-the-Go, are trade marks of Osprey. Other logos and names used on our site may also be the trade marks of Osprey or their respective owners. No permission is given by us in respect of the use of any such trade marks, names or logos and such use may constitute an infringement of the holder’s rights. 7.6. Any rights not expressly granted in these terms are reserved. 8.1. Whilst Osprey welcomes any feedback you have on any of our existing packs or pack features, Osprey does not accept or consider unsolicited ideas, including ideas for new products or features, product or feature improvements, new technologies, processes, materials, services, advertising or promotion campaigns, marketing, or new product/feature names. Please do not submit any unsolicited ideas, original creative artwork, suggestions or other works (“submissions”) in any form to Osprey or any of its employees. The purpose of this policy is to avoid potential misunderstandings or disputes when Osprey’s products, features, services or marketing strategies might seem similar to ideas submitted to Osprey. If, despite our request for you not send us your ideas, you still submit them, then regardless of the content of any letter, email, cover, or other transmission sent with the submission, the following terms shall apply to your submissions. 8.2.4 There is no obligation on Osprey to keep any submissions confidential. 8.1. The information provided in our website is intended to provide general information only and, as such, should not be considered as a substitute for advice covering any specific situation. Whilst we endeavour to ensure that the information on our website is correct, we don’t warrant the accuracy and completeness of that information. The material on our website may be out of date, and we make no commitment to update such material. 8.2. We take every reasonable care to ensure that all orders and subsequent transactions are conducted via a secure link. However, the security of information and payments transmitted via the internet can’t be guaranteed and as we aren’t responsible for the operation of the secure link we won’t, unless we are negligent, be liable for any loss you may suffer if a third party obtains unauthorised access to any information you provide. 8.3. We don’t warrant that the functions contained in our site will be uninterrupted or error free, that defects will be corrected, or that our site or the servers that make it available are free of viruses or bugs or represent full functionality, accuracy or reliability of the materials. We won’t be liable for any loss, disruption or damage to your data or your computer system or any other damages (including amongst other losses, loss of profit or loss of use) arising out of your use or delay or inability to use our site, its content or any link to another website arising in contract, tort (including negligence) or otherwise except in the case of death or personal injury caused by our negligence. 10.1. We don’t limit in any way our liability by law for fraud or death or personal injury caused by our negligence or breach of statutory duty or any other liability which can’t be excluded or limited under applicable law. 10.2.3. Loss or damage relates to a business (including loss of profits, revenue, contracts, anticipated savings, data, goodwill or wasted expenditure). 11.1. Our site may contain links to third party websites. Such links are provided for your convenience only. We don’t control those websites and aren’t responsible for their contents. The mere inclusion of such links doesn’t imply any endorsement of the material on those websites nor any association with their operators. If you decide to access any of the third party websites linked to or from our website, you do so entirely at your own risk. We can’t guarantee that these links will work all the time and we have no control over the availability of the linked pages. 11.2.6. Your website doesn’t contain content that is distasteful, pornographic, infringes any intellectual property rights or other rights of any other person or any other content of the type referred to in term 5.2 or otherwise does not comply with all applicable laws and regulations. 11.3. At any time and at our complete discretion we reserve the right to withdraw the permission to make website links to our site. 12. If any provisions of these Terms are determined to be illegal, invalid or otherwise unenforceable by reason of the laws of any country in which these Terms apply, then so far as these Terms apply within that country in which those provisions are illegal, invalid or unenforceable those provisions shall be severed and deleted from these Terms and the remaining provisions of these Terms shall survive, remain in full force and effect and continue to be binding and enforceable. We won’t be liable to you for any delay in delivering any products or for breach of our obligations, if the delay or breach is due to acts of God, civil commotion, riots, malicious damage, adverse weather conditions, floods, drought, fire, epidemic, legislation, failure of ISP or telecommunications provider or any other cause beyond our reasonable control. This does not affect your statutory rights. These Terms, use of our site, the supply of products and services by us and all Osprey competitions and prize draws are governed by and to be interpreted in accordance with English law. For your convenience we may from time to time display a translated version of these Terms on our website in languages other than English, and if so the translated versions are intended to be (so far as possible) an exact translation of the English version. In the event of any difference in meaning between the English version and a translated version, the English version will take precedence and apply. 16.1. All orders for products are subject to availability and we reserve the right to refuse to supply to any individual or company. 16.2. Your submission of an order represents an offer to purchase the products indicated by you and is not binding on us until we have accepted your order. This means that if a product is shown on our site but is not available or is incorrectly priced or otherwise incorrectly described or if we are unable to arrange delivery to your address or wish to decline your order for any reason, we won’t be obliged to sell you that product in which case we will let you know and will not charge you for the product. 16.3. Shortly after we receive your order, we will acknowledge it by email, detailing the products you have ordered. This email is issued automatically and doesn’t mean that your order is accepted. 16.4. Acceptance of your order for a product and completion of the contract between you and us will take place when we dispatch the product to you. Any products on the same order which we have not dispatched to you don’t form part of that contract. 16.5. You are responsible for ensuring the accuracy of the details provided on the order form. The price you pay is the price displayed on our site at the time we receive your order apart from where an error has occurred in displaying the price. Whilst we do our best to ensure that all prices on our site are accurate, errors may occur. If we discover an error in the price of products you have ordered we will inform you as soon as possible and give you the option of reconfirming your order at the correct price or cancelling it. If we‘re unable to contact you we will treat the order as cancelled. If you cancel and you have already paid for the products, you will receive a full refund. Prices displayed include VAT where applicable. All sizes and dimensions of products as indicated on our site are approximate but we make every effort to make sure they are as accurate as possible. We have made every effort to display as accurately as possible the colours of the images that appear on our site. However, as the actual colours you see will depend on your device, we can’t guarantee that the display on your device of any colour will accurately reflect the colour of the product on delivery. By placing an order you consent to payment being charged to your debit or credit card or PayPal account as provided on the order form. In case of query, please call +44 (0)1202 946444 (Monday to Friday, 8.30am to 5.00pm UK time, excluding bank holidays in England), quoting your order reference number. If you are having problems making a payment using the site, please call +44 (0)1202 946444 (Monday to Friday, 8.30am to 5.00pm UK time, excluding bank holidays in England). Please note, whilst we are responsible for the transaction, this is an area over which we have very little control. Unfortunately, we don’t currently deliver to any countries other than the above. Our standard delivery is between 1 and 6 days, depending on the country to which the parcel is sent. Please note that adverse weather conditions and other circumstances beyond our control can seriously impact these delivery times. We ship to Austria, Belgium, Denmark, Finland, France, Germany, Ireland, Italy, Luxembourg, Netherlands, Norway, Spain, Sweden, Switzerland and the UK. If you wish to cancel your order, please inform us in writing by emailing care@ospreyeurope.com, ensuring you quote your Order Number in all correspondence. Providing your order hasn’t yet been dispatched from our warehouse we’ll happily cancel it for you and process your refund. Once your order has been dispatched you’ll need to wait for it to arrive and then you can return for a refund – see below. To exercise your statutory cancellation right please notify us in writing of your cancellation by emailing care@ospreyeurope.com quoting your Order Number. We want all of our customers to be 100% happy with their purchase. Except where we have customised a product to your requirements, if you need to return an unused item to us, you can do so within 30 days of receiving it. The returned items must be returned unused and with all original packaging, tags & labels. To help you with your Christmas shopping we offer an extended Christmas returns policy. Products ordered between 1 December and 24 December can be returned to us by the following 31 January, i.e. if you order between 1 December and 24 December 2017 you must return the item to us so that we receive it back by 31 January 2018. If you experience a problem with your product once you have used it please see our Guarantee page and Returns section if products are faulty. When making a refund (other than a refund for a faulty product), we will deduct form the sum to be refunded any reduction in the value of the products returned caused by you using or handling the products beyond the manner in which you would handle the products if you were looking at them in a shop in order to establish the nature, characteristics and functioning of the products. If you cancel before we dispatch the products, of you telling us that you want to cancel the order. If for any reason you suspect that your credit card has been used to make an inaccurate or incorrect transaction through this website, please advise us at the earliest opportunity by calling our Customer Service Team +44 (0)1202 946444. We will investigate and arrange a refund as necessary. We’re really sorry that this has happened. Please call our Customer Services Team on +44 (0)1202 946444. Our opening hours are 8.30am to 5pm Monday to Friday (excluding Bank Holidays in England). Alternatively, please send us an email, quoting your Order Number to care@ospreyeurope.com or return the product to us for a refund, see return process above. If you receive a product which is faulty, please contact our Customer Services Team as soon as possible. You can call on +44 (0)1202 946444. Our opening hours are 8.30am to 5pm Monday to Friday (excluding Bank Holidays in England). Alternatively, please send us an email, quoting your Order Number to care@ospreyeurope.com. If sending an email, please describe the issue and if possible attach a photo of the fault. To get your product repaired or replaced, or to receive a refund, you will need to return it to us and our Customer Services Team will help you do this, either by emailing you a free returns label or by arranging collection. But we’re very sorry if we’ve made a mistake in refunding your order. Do please remember that in certain circumstances we do not refund the delivery charge and will make a deduction for any reduction in value caused by your use of the products – see Refunds. In the event that you’ve received an incorrect refund, please call our Customer Services Team on +44 (0)1202 946444 who will do their best to resolve it quickly and efficiently. Note – we will not make the refund until we have received the products back or you have supplied evidence of having sent back the products, whichever is earliest. I bought one of your products from one of your dealers’ stores and it’s faulty. Can I send it back to you for a refund? No, please return the product to the store that you bought it from and they will handle the refund. 22.1.2 We hope that you are happy with your products and the service you receive, but should you have any queries or problems please contact our Customer Services Team on +44 (0)1202 946444 or care@ospreyeurope.com. 22.1.3 We will try to resolve your complaint as quickly as possible but if we are unable to do so you may refer your complaint to an ADR (alternative dispute resolution) provider https://www.tradingstandards.uk/consumers/support-advice?qry=ADR and we will cooperate with the ADR provider in trying to find a mutually acceptable resolution. 22.1.4 Alternatively, you may refer the matter to the Online Dispute Resolution Platform with whom we will cooperate in trying to find a mutually acceptable resolution. 1. References in these Terms to “Competition” include both competitions and prize draws unless indicated otherwise. 2. These Terms apply in addition to the specific rules stated in the promotional materials for the Competition (“Specific Rules”) and you should follow the instructions for each Competition carefully in order to enter. You should therefore read these Terms in combination with any Specific Rules. Where any Specific Rules conflict with these Terms, the Specific Rules will take precedence. 3. Employees of Osprey Europe, its distributors, agents and anyone connected with a Competition, together with their families, may not enter a Competition. 4. If you’re not the bill payer for the mobile phone you’re using, you must get permission from the bill payer before entering a Competition by text. 5. Note that invalid or unsuccessful entries made via premium rate phone numbers or text may still be charged. 6. For Competitions linked to entrants signing up to receive Osprey news, the winner will be selected from all entrants who enter by the closing date and who are still subscribed to receive Osprey news at that date. 7. Winners should allow up to 28 days for delivery of prizes or any longer period referred to in the Specific Rules. 8. Prizes will be dispatched to winners via the UK mail service, unless otherwise stated. We will not be liable for any prizes which are lost, delayed or damaged in the post for reasons beyond our control. 9. Should a winner’s contact details change, it is their responsibility to notify us. 10. We reserve the right to request proof of a winner’s identity in the form of a passport or driver’s licence and proof of address in the form of a utility bill. In the event that a winner can’t provide us with proof of identity reasonably acceptable to us, we may withdraw the prize and select another winner. 11. If a winner doesn’t claim a prize within 28 days of being notified, or if a winner isn’t available to take up the prize, we may award the prize to another entrant (or not award the prize at all) without liability to the winner. 12. All prizes are subject to availability, non transferable and non exchangeable. We may change the prize to a prize that we consider to be of broadly equivalent value. There is no cash alternative. 13. For any prize provided by a third party, such as holidays or excursions, winners are required to meet all conditions and stipulations of that third party. 14. For prizes involving travel, the winner is responsible for ensuring that they have a valid passport if required and any other necessary documentation together with appropriate travel insurance. 15. Where prizes include a place for a travelling companion/guest (e.g. a holiday for the winner plus guest) then these Terms also apply to those persons. 16. No additional, further or other costs or expenses are included in any prize unless stated. For example, the costs of transport to and from a venue or an event are not included nor insurance and any accommodation prize includes basic room cost only. 17. We will not be liable or responsible for any loss or damage suffered by any winner who fails to redeem a holiday prize for any reason, including amongst other things as a result of any Government travel warning or advisory (and shall have no obligation to substitute any alternative prize, cash equivalent or other compensation). 18. Where a prize involves the winner’s attendance at (or tickets to) an event, we will not be liable or responsible if any part of the event is cancelled, varied or rescheduled for any reason. If this means that the winner (and/or any accompanying guests) cannot attend the relevant event, we shall be under no obligation to provide any cash or alternative tickets. 19. Where prizes involve “meet and greet” elements with celebrities/athletes, the prize may be subject to the availability of the celebrity/athlete in question and we will have no liability for any inability or failure of any winner to attend any “meet and greet” session offered on any date nor will we offer any alternative prize or cash alternative or compensation for such failure. 20. Sending a text message or email or posting an entry isn’t proof of receipt of entry. Neither we nor our contractors accept any responsibility whatsoever for any technical failure or malfunction or any other problem in any telephone network or line, system, server, provider or otherwise which may result in any text message, email or postal entry being lost or not properly recorded. We are also not responsible for traffic congestion or other capacity issues which may result in a text message or email not being able to get through or a text message or email not being recorded. 21. Unless specified otherwise entrants must only enter each Competition once and must use their legal name. We reserve the right to disqualify any entrant who uses multiple names and to require them to return any prize they may have won. Entrants may not enter or participate as part of a syndicate or on behalf of any other person, syndicate, group, society or company. You may not enter a Competition using automated entry software or any other mechanical or electronic means that permits any person to enter any Competition repeatedly. 22. All entries must be the original work of the entrant. Entries won’t be returned and become our property. By submitting your entry you undertake to us that your entry is not in breach of any third party intellectual property rights and assign all copyright and other intellectual property rights in your entry to us and you irrevocably and unconditionally waive in perpetuity any so called “moral rights” in your entries and grant any consents required under the Copyright Designs and Patents Act 1988 so that we may use and amend your entries in any way without limitation, including (but not limited to) post promotion publication. 23. You agree that if you win we may publish your name.If you win you may also be required to participate in publicity, including photographs and videos, which may be used to promote our products. You agree that we may use all resulting publicity materials in any medium (including online). 24. Before sending us any photos or video containing images of people, please make sure that those people have agreed to their images being used in this way to the extent that this is necessary. This is a complicated issue but as a general guide, if your photo features a crowd of people, you are less likely to need to obtain the consent of each person in the picture than if your photo is of a small group of people or a single person. The easier it is to identify a person from your photo, the more likely it is that you will need to obtain their consent. Special care should be taken when taking photographs of children. 25. In entering a Competition you must not submit any material of the types referred to in term 5.2 (Website and social media content and user-generated content). 26. To the fullest extent permitted by law, we exclude all warranties, representations, covenants and liability (whether express or implied) regarding the Competition or the prize but this won’t exclude our liability for death or personal injury as a result of our negligence. 27. Any personal data collected will be used solely in accordance with current UK data protection legislation. Please see our Privacy and cookie statement for further details. 28. Our decision as to the winner is final. In the event of any dispute regarding the Competition, our decision will be binding and no correspondence or discussion will be entered into. 29. We may disqualify you from winning the prize if we have reasonable grounds to suspect you may be in breach of the Competition rules or these Terms and/or your use of a mobile phone and/or your participation in the Competition may be fraudulent or otherwise unlawful. 30. We reserve the right to amend or to cancel, alter or amend a Competition at any stage, if deemed necessary in our opinion, or if circumstances arise outside our control. You can use Osprey Gift Cards to purchase goods online at www.ospreyeurope.com only. 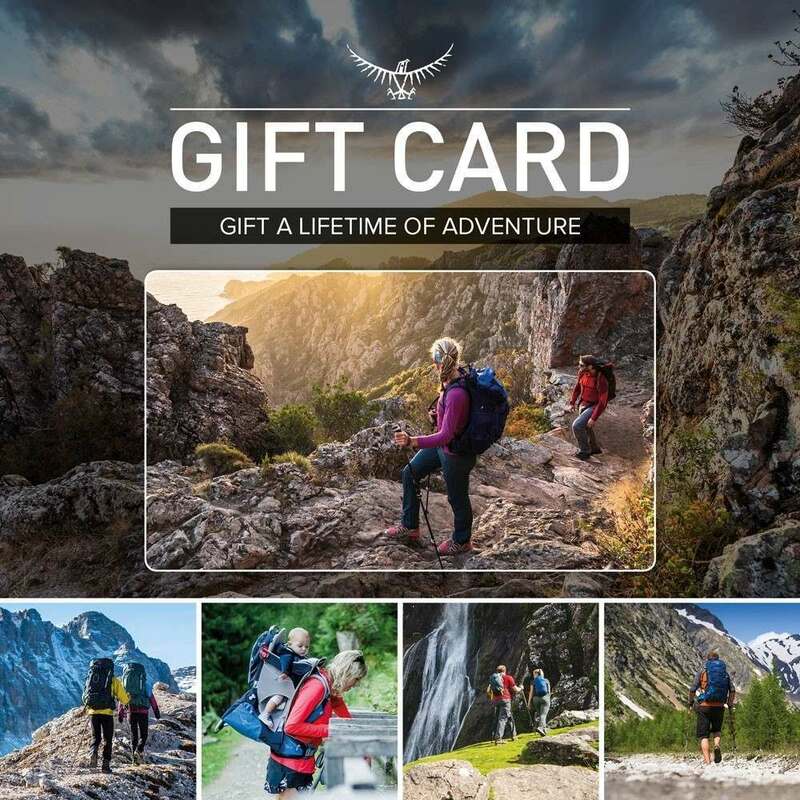 Osprey Gift Cards can be purchased at ospreyeurope.com with a minimum value of £25 online (25 Euros, 250 DKK, 250 SEK, 250 NOK, 25 CHF). Osprey Gift Cards have a maximum value of £200 (200 Euros, 2000 DKK, 2000 SEK, 2000 NOK, 200 CHF). When you redeem Osprey Gift Cards online for products available via ospreyeurope.com, you will be required to enter the unique Gift Card code within the Checkout. When using an Osprey Gift Card online and the total order value is less than the value of the Osprey Gift Card, any balance will remain accessible using the same code. If a purchase exceeds the redeemer’s Gift Card balance, the remaining amount must be paid with another payment method. Osprey Gift Cards must be redeemed on the online store they were purchased from. Multiple Osprey Gift Cards can be bought, however, for each Osprey Gift Card bought, a separate Osprey Gift Card email and unique code will be generated. Osprey Gift Cards cannot be exchanged for cash. We do not give change or refunds on Osprey Gift Card transactions. The Osprey Gift Card will expire 12 months (365 days) from date of purchase or after the Gift Card has been received when a Gift Card has been scheduled to be sent to a recipient at a future date (up to 6 months in advance). We will not refund any balance remaining and we will invalidate the card after the 12-month period. If you return goods you have paid for in full using an Osprey Gift Cards, we will credit monies back to you via a newly generated Gift Card code. This does not affect your statutory rights. If you return an entire order to us where you have part-paid using an Osprey Gift Card, we will credit the value of the Gift Card back to you via a newly generated Gift Card code. If any other payment method was also used at the time of purchase, the rest of the monies owed will be refunded via the original payment method. This does not affect your statutory rights. Where multiple goods have been purchased and completely depleted the Gift Card value but only part of the order is returned and the remainder of the order kept still exceeds the Gift Card value, the Gift Card will be deemed to be redeemed in full and a cash refund for the balance of the returned order will be provided. The risk of loss and title for Osprey Gift Cards pass to the purchaser upon our electronic transmission of the Gift Card to the purchaser or designated recipient. We are not responsible if any Gift Card is lost, stolen, destroyed or used without your permission, including sending to an incorrect recipient (e.g. : misspelling of recipient’s email address). We reserve the right to refuse to accept an Osprey Gift Card code which we deem to be duplicated or which otherwise is suspected to be affected by fraud. We will have the right to close customer accounts and take payment from alternative forms of payment if a fraudulently obtained Gift Card is redeemed and/or used to make purchases on ospreyeurope.com. We reserve the right to amend the Osprey Gift Card Terms & Conditions from time to time, where we consider it reasonable and necessary to do so. This is an Osprey (“we/”us”/”our”) competition. For more info about us take a look at our website at www.ospreyeurope.com. The competition commences Monday 2nd April 2018 at 8:30am GMT+1 and will run monthly with a winner being drawn after the final day of each month. All entries must be received by 23:59pm, on the final day of each month to be included in that month’s draws. No entry details submitted after this time will be valid for that month’s prize draw. The monthly draw will continue until Osprey removes the promotion. All entrants must be aged 18 years or over and be a UK/European resident. Employees of Osprey Europe, its distributors or agents and anyone connected with the competition, together with their families, may not enter the competition. Leave a review of a pack they have purchased. Maximum of 1 x Osprey Europe Gift Card worth £50.00 to be won each month. The prize from Osprey is subject to change for subsequent months. All prizes are subject to availability, non-transferable and non-exchangeable. We may change the prize to a prize that we consider to be of broadly equivalent value. There is no cash alternative. The Osprey Europe Gift Card can only be redeemed on products on the ospreyeurope.com website. Each month, a winner will be chosen at random from all those who entered the competition. The winner will be notified by email by the Osprey Europe within 14 days of the closing date (last day of each month). Osprey Europe’s decision is final. The prize (Osprey Europe Gift Card) will be dispatched digitally via email to the winner. The email address used in the Osprey Europe Account will receive the Osprey Gift Card email. Should a winner’s contact details change, it is their responsibility to notify us. We reserve the right to request proof of a winner’s identity in the form of a passport or driver’s licence and proof of address in the form of a utility bill. In the event that a winner can’t provide us with proof of identity reasonably acceptable to us, we may withdraw the prize and select another winner. We reserve the right to amend or to cancel, alter or amend the competition at any stage, if deemed necessary in our opinion, or if circumstances arise outside our control. If you have any questions relating to these Terms, please email us at: marketing@ospreyeurope.com.Entry implies acceptance of these terms and conditions. Free Hydraulics LT 1.5L Reservoir with purchases of Backpacking packs from www.ospreyeurope.com. Buy a Backpacking pack from this website and we’ll send you one free Hydraulics LT 1.5L reservoir per pack purchased, whilst stocks last. Offer valid from 1st May 2015 until 31st May 2015 whilst stocks last or until the promotion is withdrawn. Osprey reserves the right to alter, amend or withdraw this promotion without prior notice. Reservoirs cannot be exchanged for monetary value. Allow up to 28 days for delivery. We will not be liable for any Reservoir which is lost, delayed or damaged in the post. If you decide to return your Backpacking pack to us, you must also return your reservoir in order for your refund to be processed. All other Terms & Conditions apply. Free 6L Ultralight Drysack when you buy any Osprey hiking pack offer valid online only on www.ospreyeurope.com. Offer is valid from 3pm 29th April 2016 expires midnight 31st May 2016. Offer excludes the Talon 6 Lumbar. Allow up to 28 days for delivery. We will not be liable for any Drysack which is lost, delayed or damaged in the post. If you decide to return your Hiking pack to us, you must also return your Drysack in order for your refund to be processed. All other Terms & Conditions apply. Free Ultralight Washbag Padded when you buy any Osprey travel pack, offer valid online only on www.ospreyeurope.com. Offer is valid from 12pm 16th August 2016 expires midnight 5th September 2016. Allow up to 28 days for delivery. We will not be liable for any Ultralight Washbag Padded which is lost, delayed or damaged in the post. If you decide to return your Travel pack to us, you must also return your Ultralight Washbag Padded in order for your refund to be processed. All other Terms & Conditions apply. This is an Osprey (“we/”us”/”our”) For more info about us take a look at our website at www.ospreyeurope.com. All entries must be received by midnight 31st January 2018. Maximum 1 x Farpoint 40 (Male) or Fairview 40 (Female) pack to be won (colour of the pack to be determined by Osprey Europe upon winner selection). A winner will be selected at random from all entrants who sign up by midnight on 31st January 2018 and who are still subscribed to receive Osprey news. Winners will be notified by email within 28 days of the competition closing and will be asked to choose the Male or Female version of the pack. If you win you may also be required to participate in publicity, including photographs and videos, which may be used to promote Osprey products. You agree that we may use all resulting publicity materials in any medium (including online). Winners should allow up to 28 days for delivery of prizes. All prizes are subject to availability, non-transferable and non-exchangeable. We may change the prize to a prize that we consider to be of broadly equivalent value. There is no cash alternative. Prizes will be dispatched to winners via UPS or other depending on the winner’s location unless otherwise stated. We will not be liable for any prizes which are lost, delayed or damaged in the post for reasons beyond our control. Posting an entry on our website isn’t proof of receipt of entry. Neither we nor our contractors accept any responsibility whatsoever for any technical failure or malfunction or any other problem in any telephone network or line, system, server, provider or otherwise which may result in any text message, email, online or postal entry being lost or not properly recorded. We are also not responsible for traffic congestion or other capacity issues which may result in a text message or email not being able to get through or a text message or email not being recorded. If you have any questions relating to these Terms, please email us at marketing@ospreyeurope.com. Free Ultralight Stuff Pack – Poppy Orange when you buy any Osprey Wheeled Travel pack, offer valid online only on www.ospreyeurope.com. Offer is valid from 12 pm 29th September 2017 expires midnight 31st October 2017. Allow up to 30 days for delivery. We will not be liable for any Ultralight Stuff Pack which is lost, delayed or damaged in the post. If you decide to return your Wheeled Travel pack to us, you must also return your Ultralight Stuff Pack in order for your refund to be processed. All other Terms & Conditions apply. The competition commences Friday 16th February, 2018 at 5:00pm. All entries must be received by 23:59pm, 16th March 2018. No entry details submitted after this time will be valid. Entry is open to residents of Europe who are aged 18 or older, but excludes employees of Nikwax and Osprey Europe, their immediate families, anyone connected professionally with the prize draw, or any person where entering this competition breaches any law or regulation of the jurisdiction in which they are resident. Nikwax and Osprey Europe’s decision is final. Nikwaxm, Osprey and its affiliates reserve the right to amend or withdraw the prize draw and any of the prizes in the event of any unforeseen circumstances outside their reasonable control. Prizes are subject to availability. In the event of unforeseen circumstances, the promoter reserves the right to substitute alternative prizes of equivalent or greater value. No correspondence will be entered into. Open to entries between 9th March and 23rd March 2018. All entries must be received by midnight 23rd March 2018. Entrants must be ‘Following’ the Osprey Europe Instagram page (@ospreyeurope) and liked the Instagram post about the competition OR ‘Following’ the Osprey Europe Twitter page (@ospreyeurope) and retweeted the Twitter post about the competition. Maximum of 1 x prize bundle to be won which will include 1 x Farpoint 40 or Fairview 40 (depending on gender), Ultralight Packing Cube Set, Ultralight Washbag Zip and Document Zip Wallet. A winner will be selected at random from all entrants who enter by midnight on 23rd March 2018. A winner will be selected at random from all entrants who enter by midnight on 23rd March 2018. Winners will be notified by Osprey Europe direct messaging them on Instagram within 28 days of the competition closing. All prizes are subject to availability, non transferable and non exchangeable. We may change the prize to a prize that we consider to be of broadly equivalent value. There is no cash alternative. Sending an email or posting an entry to social media isn’t proof of receipt of entry. Neither we nor our contractors accept any responsibility whatsoever for any technical failure or malfunction or any other problem in any telephone network or line, system, server, provider or otherwise which may result in any text message, email, online or postal entry being lost or not properly recorded. We are also not responsible for traffic congestion or other capacity issues which may result in a text message or email not being able to get through or a text message or email not being recorded. If you have any questions relating to these Terms, please email us at: marketing@ospreyeurope.com. The competition commences Friday 16th March, 2018 at 4:00pm. All entries must be received by 23:59pm, 31st March 2018. No entry details submitted after this time will be valid. Entry is open to residents of DEUTSCHLAND, SCHWEIZ, ÖSTERREICH, FRANCE, LUXEMBOURG, SUISSE, BELGIQUE and ESPAÑA who are aged 18 or older, but excludes employees of Buff and Osprey Europe, their immediate families, anyone connected professionally with the prize draw, or any person where entering this competition breaches any law or regulation of the jurisdiction in which they are resident. Buff and Osprey Europe’s decision is final. Buff, Osprey and its affiliates reserve the right to amend or withdraw the prize draw and any of the prizes in the event of any unforeseen circumstances outside their reasonable control. Prizes are subject to availability. In the event of unforeseen circumstances, the promoter reserves the right to substitute alternative prizes of equivalent or greater value. No correspondence will be entered into. Entry is open to residents of the UNITED KINGDOM who are aged 18 or older, but excludes employees of Wild Bunch Media (UK Men’s and Women’s Running) and Osprey Europe, their immediate families, anyone connected professionally with the prize draw, or any person where entering this competition breaches any law or regulation of the jurisdiction in which they are resident. If the randomly selected winner doesn’t claim the prize package within 28 days of being notified, or if a winner isn’t available to take up the prize, we may award the prize to another entrant (or not award the prize at all) without liability to the winner. Wild Bunch Media (UK Men’s and Women’s Running) and Osprey Europe’s decision is final. Wild Bunch Media (UK Men’s and Women’s Running), Osprey and its affiliates reserve the right to amend or withdraw the prize draw and any of the prizes in the event of any unforeseen circumstances outside their reasonable control. Prizes are subject to availability. In the event of unforeseen circumstances, the promoter reserves the right to substitute alternative prizes of equivalent or greater value. No correspondence will be entered into.